Markets are heading further into uncharted territory and investors are faced with conditions such as the start of a global tightening of monetary policy after years of easing, a shift in power from old school political incumbents, the renewed threat of a rogue state wielding nuclear power and increasing debt levels in the world’s second largest economy. The intersection of such events provides investors with both profitable and risky opportunities alike. An intelligent investor would navigate such choppy waters through a diversified portfolio spread across multiple asset classes and various regional allocations. Active management strategies which minimise risk in any asset class should help the portfolio benefit from potential upside, while buffer it during a downturn. With political and policy uncertainty likely to inject more turbulence into markets, the fund’s focus on managing volatility whilst adopting a flexible and unconstrained approach to delivering consistent income may be particularly useful for investors. The fund provides investors access to a large variety of asset classes including non-traditional assets such as preferred stocks, listed master limited partnerships and real estate vehicles, aside from conventional stocks and bonds. Investors are thus able to invest in a portfolio that is highly diversified across both asset classes and regional exposure. The fund offers an average pay-out of 5 to 6 per cent per annum, which is not guaranteed and may rise or fall. 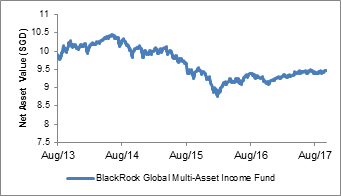 Source: NAV chart based on Bloomberg data as at 23 October 2017; fund information extracted from the fund’s factsheet provided by BlackRock Investment Management was as at 30 September 2017. Note: Performance as at 30 September 2017, for the SGD Hedged Share Class, calculated on an offer-to-bid basis with all dividends and distributions reinvested, net of all charges payable upon reinvestment, if any. Performance figures exceeding 1 year, if any, were stated on an average annual compounded basis. Asian markets remained on a steady growth trajectory in Q3 2017, buoyed by positive economic momentum in China. The 19th Party Congress concluded recently, with no major shift in policy direction for the next five years being mentioned for China. This adds to the region’s stability. However, the undercurrent of growing regional debt stemming largely from China and the timing of S&P’s downgrade of the nation’s sovereign debt is becoming increasingly worrisome and will be a point of urgency for China's post-election leadership committee to address. As other developed markets embark on gradual monetary tightening, some emerging markets may experience lesser capital inflows and financial support. For investors looking to gain exposure in a region rife with potential near term risks, we advocate an active management strategy that provides flexibility between asset class holdings. 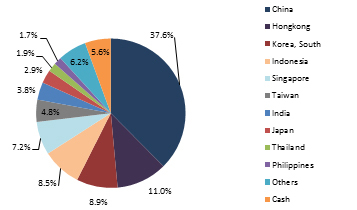 The fund invests in Asia through a flexible multi-asset approach, reducing overall portfolio volatility. 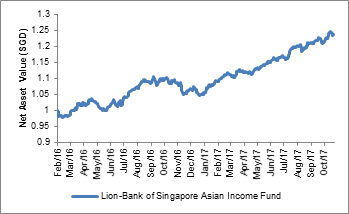 Following a Tactical Asset Allocation framework devised by the Bank of Singapore - OCBC’s private banking arm - the fund is able to adjust the size of its market participation by actively tweaking the composition of its holdings to either defend itself against downside risks or ride on favourable market conditions to generate returns. Investors may benefit from a potentially stable and regular income stream, derived from traditional stocks and bonds as well as option fee premiums. The latter arises from the ability of the fund to write covered call options or take active bets against overvalued stocks, giving the fund an edge over its competitors in terms of delivering income. 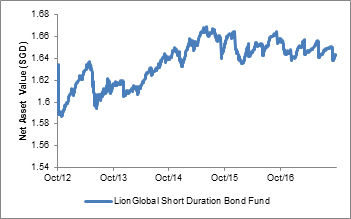 Source: NAV chart based on Bloomberg data as at 23 October 2017; fund information extracted from the fund’s factsheet provided by Lion Global Investors Limited was as at 30 September 2017. Note: Performance as at 30 September 2017 (for the SGD-Hedged Class A Acc share class only), calculated on an offer-to-bid basis with all dividends and distributions reinvested, net of all charges payable upon reinvestment, if any. Performance figures exceeding 1 year, if any, were stated on an average annual compounded basis. Although markets move and opinions change, one adage holds constant. A robust and diversified portfolio geared for the long term goes a long way. When focusing on the longer term, immediate market concerns - while notable – should not serve to distract from the initial investment goals. 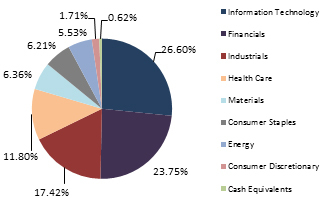 A strong portfolio diversified across various asset classes, as well as spread across an array of subclasses and industry sectors, may prove more able of weathering the test of time. The use of Exchange Traded Funds or ETFs in a portfolio can be an added boost, as ETFs enable access to a huge range of investment options across asset classes, sectors and geographies. 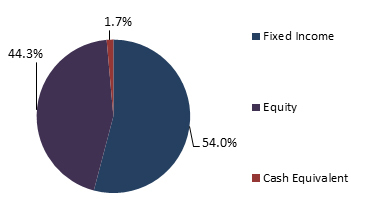 ETFs also add extra liquidity into a portfolio at a lower cost compared to traditional investment methods. Investors with a longer term investment horizon but who do not wish to miss out on current market opportunities may choose to invest partially in a core portfolio, and rotate selectively among other market driven strategies. 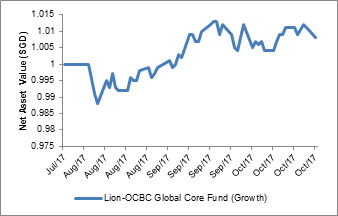 The Lion-OCBC Global Core fund is a low cost, Exchange Traded Funds-based (ETFs)-based investment solution that is diversified globally and across multiple asset classes. The portfolio is rebalanced regularly, typically on a quarterly basis to stay relevant and adjust to changing market conditions. The portfolio seeks to provide a sustainable level of income and medium- to long-term capital growth while targeting an above-average level of portfolio risk. This concept of a fund of ETFs and relatively less active management allows the fund manager to charge investors a lower fee. Low cost diversification via such an investment proposition thus provides a solid foundation upon which investors could build their investment portfolio on. Note: Performance as at 30 September 2017, for the SGD Hedged O Distributed Share Class, calculated on an offer-to-bid basis with all dividends and distributions reinvested, net of all charges payable upon reinvestment, if any. Performance figures exceeding 1 year, if any, were stated on an average annual compounded basis. Monetary policy tightening, in the form of interest rate hikes and cuts to central banks’ balance sheets will spread from North America to a range of other developed economies in the coming year. In the U.S., the mystery of low inflation may temporarily slow down the pace of interest rate hikes, but it is unlikely to shift the Fed from its course of raising rates and shrinking the balance sheet. Expectations for the European Central Bank to cut its quantitative easing programme point towards 1H2018 and will remain as such if the European economy stays on its road to recovery. Investors looking to hold fixed income in their portfolios should aim for shorter duration assets which are less impacted by rising interest rates. The fund’s focus on short duration bonds means investors are less exposed to a rising interest rate environment risk. It also addresses investors’ conservative low-return dilemma by aiming to deliver non-guaranteed quarterly payouts of around 2.5 per cent per annum as a form of regular income. To guard against credit risk, investors are exposed to a diversified portfolio of investment grade corporate bonds, issued mainly by Asian corporates. The fund is included in the Central Provident Fund Investment Scheme. Note: Performance as at 30 September 2017, for the SGD A Distribution Share Class, calculated on an offer-to-bid basis with all dividends and distributions reinvested, net of all charges payable upon reinvestment, if any. Performance figures exceeding 1 year, if any, were stated on an average annual compounded basis. Although markets move and opinions change, one adage holds constant. A robust and diversified portfolio geared for the long term goes a long way. When focusing on the far sight, immediate market concerns while notable are far less impactful. Instead, a strong foundation built with the aim of reducing cost compounding at the expense of more nuanced investment strategies may prove to be more capable of weathering the test of time. Such cost efficiency can manifest in a portfolio through the use of ETFs which provide for a broader form of stock-picking while allowing the investor to focus on the macro economy. Those seeking a balance between the longer term and the immediate may choose to partially invest in a core portfolio while rotating amongst other more market driven strategies. 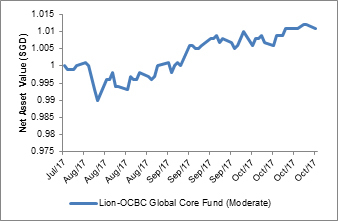 The Lion-OCBC Global Core fund is a low cost, Exchange Traded Funds-based (ETF-based) investment solution that is diversified globally and across multiple asset classes. The portfolio is rebalanced regularly, typically on a quarterly basis to stay relevant and adjust to changing market conditions. The portfolio seeks to provide a sustainable level of income and moderate medium- to long-term capital growth while keeping within a target level of volatility. This concept of a fund of ETFs and relatively less active management allows the fund manager to charge investors a lower fee. Low cost diversification via such an investment proposition thus provides a solid foundation upon which investors could build on. President Donald Trump’s proposed tax reform plans gave equity markets a second wind, pushing already steeply valued U.S. stocks even higher. Yet, despite U.S. indices having clocked consecutive highs, the possibility of an extended stock market rally remains intact. Economic fundamentals remain firm, placing markets in a position to react even more favourably if Trump’s corporate and repatriation tax plans take off. With earnings season for Q3 2017 meeting expectations on the whole, the Federal Reserve is expected to hike interest rates in 2018, in addition to the one in December 2017. A more selective approach towards stock-picking would be appropriate for investors who wish to reap the immediate benefits of potential policy change while exercising caution towards rising valuations. 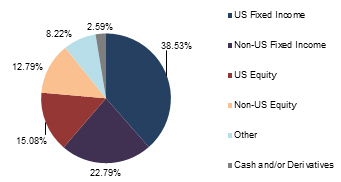 The fund has delivered strong performance since its inception by investing in U.S. with a bias towards large cap holdings. 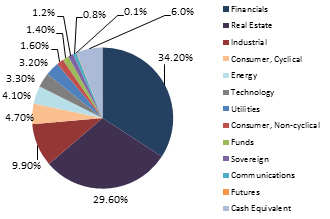 The fund maintains a concentrated portfolio of about 30 to 40 stocks, constructed on a bottom-up basis. It relies on an opportunistic approach to investing and stock-picking is based on in-depth cash flow and capital structure analysis. 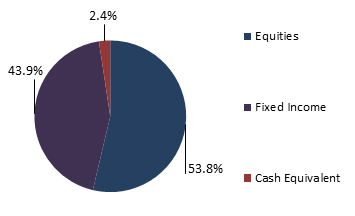 The fund has a cyclical tilt, with 64 per cent of the portfolio allocated to cyclical sectors such as financials, industrials, consumer discretionary, materials and IT. The fund is managed by an experienced and dedicated investment team based in New York. 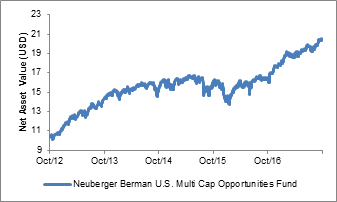 Source: NAV chart based on Bloomberg data as at 23 October 2017; fund information extracted from the fund’s factsheet provided by Neuberger Berman Investment Funds was as at 30 September 2017. Note: Performance as at 30 September 2017, for the USD A Accumulating Share Class, calculated on an offer-to-bid basis with all dividends and distributions reinvested, net of all charges payable upon reinvestment, if any. Performance figures exceeding 1 year, if any, were stated on an average annual compounded basis. Please seek advice from a financial adviser regarding the suitability of any investment product taking into account your specific investment objectives, financial situation or particular needs before you make a commitment to purchase the investment product. In the event that you choose not to seek advice from a financial adviser, you should consider whether the product in question is suitable for you. The Bank, its related companies, their respective directors and/or employees (collectively “Related Persons”) may or might have in the future interests in the investment products or the issuers mentioned herein. Such interests include effecting transactions in such investment products, and providing broking, investment banking and other financial services to such issuers. The Bank and its Related Persons may also be related to, and receive fees from, providers of such investment products. The information in this document is not intended to constitute research analysis or recommendation and should not be treated as such. This does not constitute an offer or solicitation to buy or sell or subscribe for any security or financial instrument or to enter into a transaction or to participate in any particular trading or investment strategy. Any opinions or views of third parties expressed in this material are those of the third parties identified, and not those of OCBC Group. OCBC Group does not guarantee the accuracy of the information provided herein at any time. All of the information provided herein may change any time without notice. You should not make any decisions without verifying its content. OCBC Group shall not be responsible for any loss or damage whatsoever arising directly or indirectly howsoever as a result of any person acting on any information provided herein. The information provided herein may contain projections or other forward looking statement regarding future events or future performance of countries, assets, markets or companies. Actual events or results may differ materially. Past performance figures are not necessarily indicative of future or likely performance. The contents hereof are considered proprietary information and may not be reproduced or disseminated in whole or in part without OCBC Bank’s written consent. 1. Hong Kong SAR: Oversea-Chinese Banking Corporation Limited (“OCBC Bank”) is an Authorized Institution as defined in the Banking Ordinance of Hong Kong (Cap 155), regulated by the Hong Kong Monetary Authority in Hong Kong. This document is for information only and is not intended for anyone other than the recipient. It has not been reviewed by any regulatory authority in Hong Kong. It is not an offer or a solicitation to deal in any of the financial products referred to herein or to enter into any legal relations, nor an advice or a recommendation with respect to such financial products. It does not have regard to the specific investment objectives, financial situation and the particular needs of any recipient or Investor. This document may not be published, circulated, reproduced or distributed in whole or in part to any other person without the Bank’s prior written consent. This document is not intended for distribution to, publication or use by any person in any jurisdiction outside Hong Kong, or such other jurisdiction as the Bank may determine in its absolute discretion, where such distribution, publication or use would be contrary to applicable law or would subject the Bank and its related corporations, connected persons, associated persons and/or affiliates to any registration, licensing or other requirements within such jurisdiction. 2. Indonesia: The offering of the investment product in reliance of this document is not registered under the Indonesian Capital Market Law and its implementing regulations, and is not intended to constitute a public offering of securities under the Indonesian Capital Market Law and its implementing regulations. According, this investment product may not be offered or sold, directly or indirectly, within Indonesia or to citizens (wherever they are domiciled or located), entities or residents, in any manner which constitutes a public offering of securities under the Indonesian Capital Market Law and its implementing regulations. 3. Japan: The information contained in this document is for general reference purposes only. It does not have regard to your specific investment objectives, financial situation, risk tolerance and particular needs. Nothing in this document constitutes an offer to buy or sell or an invitation to offer to buy or sell or a recommendation or a solicitation to buy or sell any securities or investment. We do not have any intention of conducting regulated business in Japan. You acknowledge that nothing in this document constitutes investment or financial advice or any advice of any nature. 4. Malaysia: OCBC Bank does not hold any licence, registration or approval to carry on any regulated business in Malaysia (including but not limited to any businesses regulated under the Capital Markets & Services Act 2007 of Malaysia), nor does it hold itself out as carrying on or purport to carry on any such business in Malaysia. Any services provided by OCBC Bank to residents of Malaysia are provided solely on an offshore basis from outside Malaysia, either as a result of “reverse enquiry” on the part of the Malaysian residents or where OCBC Bank has been retained outside Malaysia to provide such services. As an integral part of the provision of such services from outside Malaysia, OCBC Bank may from time to time make available to such residents documents and information making reference to capital markets products (for example, in connection with the provision of fund management or investment advisory services outside of Malaysia). Nothing in such documents or information is intended to be construed as or constitute the making available of, or an offer or invitation to subscribe for or purchase any such capital markets product. 5. Myanmar: The relevant Bank entities do not hold any licence or registration under the FIML or other Myanmar legislation to carry on, nor do they purport to carry on, any regulated activity in Myanmar. All activities relating to the client are conducted strictly on an offshore basis. The customers shall ensure that it is their responsibility to comply with all applicable local laws before entering into discussion or contracts with the Bank. 6. Oman: This document does not constitute a public offer of investment, securities or financial services in the Sultanate of Oman, as contemplated by the Commercial Companies Law of Oman (Royal Decree No. 4/1974), Banking Law of Oman (Royal Decree No. 114/2000) or the Capital Market Law of Oman (Royal Decree No. 80/1998) and the Executive Regulations of the Capital Market Law (Ministerial Decision No. 1/2009) or an offer to sell or the solicitation of any offer to buy non-Omani investment products, securities or financial services and products in the Sultanate of Oman. This document is strictly private and confidential. It is being provided to a limited number of sophisticated investors solely to enable them to decide whether or not to make an offer to invest in financial products mentioned in this document, outside of the Sultanate of Oman, upon the terms and subject to the restrictions set out herein and may not be reproduced or used for any other purpose or provided to any person other than the original recipient. Additionally, this document is not intended to lead to the making of any contract within the territory or under the laws of the Sultanate of Oman. The Capital Market Authority of Oman and the Central Bank of Oman take no responsibility for the accuracy of the statements and information contained in this document or for the performance of the financial products mentioned in this document nor shall they have any liability to any person for damage or loss resulting from reliance on any statement or information contained herein. 7. South Korea: The document does not constitute an offer, solicitation or investment advertisement to trade in the investment product referred to in the document. 8. Taiwan: The provision of the information and the offer of the service concerned herewith have not been and will not be registered with the Financial Supervisory Commission of Taiwan pursuant to relevant laws and regulations of Taiwan and may not be provided or offered in Taiwan or in circumstances which requires a prior registration or approval of the Financial Supervisory Commission of Taiwan. No person or entity in Taiwan has been authorised to provide the information and to offer the service in Taiwan. 9. Thailand: Please note that neither OCBC Bank nor any other entities in the OCBC Bank’s group maintains any licences, authorisations or registrations in Thailand nor is any of the material and information contained, or the relevant securities or products specified herein approved or registered in Thailand. Interests in the relevant securities or products may not be offered or sold within Thailand. The attached information has been provided at your request for informational purposes only and shall not be copied or redistributed to any other person without the prior consent of OCBC Bank or its relevant entities and in no way constitutes an offer, solicitation, advertisement or advice of, or in relation to, the relevant securities or products by OCBC Bank or any other entities in OCBC Bank’s group in Thailand. 10. The Philippines: The information contained in this document is not intended to constitute a public offering of securities under the Securities Regulation Code of the Philippines. 11. Dubai/U.A.E: This material is communicated by OCBC Bank. OCBC Bank is not a financial institution licensed in the United Arab Emirates and does not undertake banking or financial activities in the United Arab Emirates nor is it licensed to do so. This material is provided for information purposes only and is not financial advice or a financial promotion, nor is it intended to influence an investor's decision to invest. It is not to be construed as an offer to buy or sell or solicitation of an offer to buy or sell any financial instruments or to participate in any particular trading strategy in any jurisdiction. The material is only intended for persons who fulfil the criteria to be classified as "deemed Professional Clients" as defined under the DFSA rules. 12. United Kingdom: The OCBC Bank is authorised and regulated in Singapore by the Monetary Authority of Singapore. The OCBC Bank is not authorised in the United Kingdom by the Financial Conduct Authority for the conduct of investment business. The services provided by the OCBC Bank are not covered by the UK’s Financial Services Compensation Scheme and neither the Prudential Regulation Authority nor the Financial Conduct Authority supervises or regulates the products or services provided by the OCBC Bank to UK residents. 13. United States of America: This product may not be sold or offered within the United States or to U.S. persons. subscribe 2015-11-23 11:00:00 2015-11-23 12:00:00 Asia/Singapore OCBC MoneyMonday Updates Insights from OCBC’s Wealth Panel to help you grow your wealth. Visit http://ocbc.com/moneymonday. Receive S$800 cash credit into the OCBC Premier VOYAGE Card when you start a Premier Banking relationship with S$200,000 in deposits and/or investments. The placement amount must be in fresh funds only. Valid till 31 December 2017. Insured up to S$50,000 by SDIC.